Once you’ve unpacked the pumps set, you’ll have several further boxes to unpack. The ones you want are labelled Grey +90. These are actually white. They contain options for both the old SL viewer (which requires invisiprims) and the new Viewer 2 (which uses an alpha layer). Put the shoes on and wear whatever it is you want to match them to. Then head to this website and download the free little GetColor! program (I’m afraid it’s a Windows-only program, but I’m pretty sure there’s a freeware colourpicker for Mac out there somewhere). 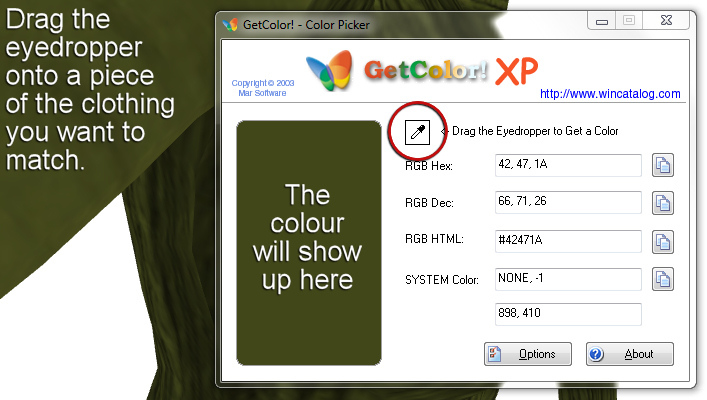 Once you’ve installed it, open it up and tab back to Second Life (GetColor! will remain on top of whatever screen you have open, until you actually close it). Although the program screencap there says ‘XP’ I’ve successfully used it on XP, Vista and Windows 7, so it should run on whichever of those operating systems you use. Click and hold the little eyedropper icon (circled in red), and drag it onto a piece of the clothing you want to match. As you move it around, you’ll notice the big block of colour will change. Once you have a colour you like, let go of the mouse button. Edit your shoes. If you’re wearing the Viewer 2 shoes then you’ll be able to edit both shoe and heel at the same time. 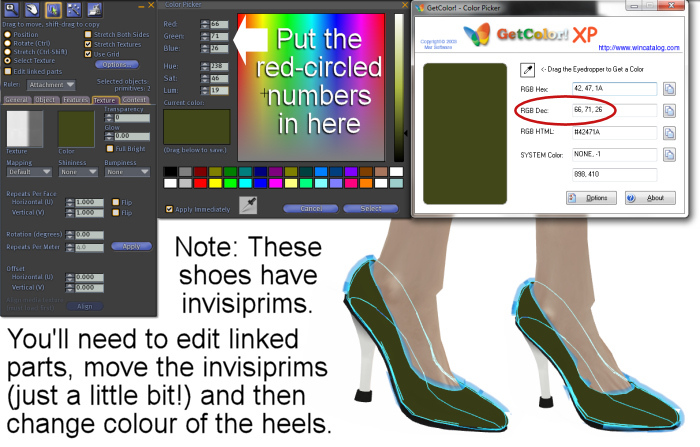 If you’re using the old viewer shoes with invisiprims, then you’ll need to Edit Linked Parts and move those invisiprims out of the way so you can reach the heel. Don’t move them too far; just enough that you can access the heel! (Once you’ve coloured the heel, select each invisiprim individually, make sure you have the Position radio button checked instead of the Texture button, then hit CTRL+Z to push the invisiprim back where it originally was.) Click the Select Texture radio button and click both the shoe and the heel. Yep, that’s another way, although I find with that one I need a pen and paper handy (or at least to be in a static pose) to write down the numbers, because the second I let go of the mouse the colour changes. Also, with GetColor! you can see a big block of whatever colour you’ve picked, whereas with the SL viewer’s version you can’t see it until you apply the colour. I got a pair of shoes from a new store, and the skin hud is a nightmare IMO…it just consists of a ball that you have to color in. This GetColor! program is helping me get RGB numbers that I can work with.